Microalgae are promising candidates for recycling of carbon dioxide (CO2) into renewable bioproducts. However, the low biomass concentration of current suspension culture systems leads to high water requirements, inefficient harvesting and high liquid transportation costs. Despite ongoing research, these still propose a challenge to the economic viability of microalgal cultivation. Microalgal biofilms provide an alternative approach to biomass production that could resolve these challenges by growing the cells attached to a surface, surrounded by a self-produced matrix of polymers. Microalgal biofilms have much higher biomass concentrations than suspension cultures, and the attached cells are easy to separate from the cultivation medium. However, cultivating microalgal biofilms requires the development of a purposefully designed cultivation system, especially due to interactions between cells and surface, persistent gradients in the biomass and the effects of flow, which play a critical role for biofilm productivity. A range of systems has been employed for the cultivation of microalgal biofilms, with biomass productivities of up to 60 grammes dry weight (g(DW)) m−2 day−1 (dry weight per ground area) outdoors and up to 80 g(DW) m−2 day−1 under laboratory conditions, respectively. However, there is considerable variation of reported results along with experimental conditions, which limits the capability for quantitative comparisons with other systems and hinders the identification of the drivers and variables that dictate microalgal biomass formation. 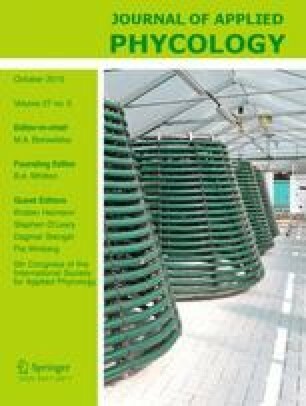 Development of standard conditions and representative species would be required for closing this gap and for realising the full potential of microalgal biofilm cultivation as a viable process for industrial biomass production.